It’s available to pre-order now with instant grat tracks ‘Through The Shadows’ and ‘Lunatic’. Specialising in a dark and brooding indie electro that has drawn comparisons with Interpol, The Killers and The National, The Slow Readers Club have already received acclaim from the likes of Steve Lamacq, Peter Hook and Eddy Temple Morris, as well as having supported James on their arena tour, and performed at festivals including Isle Of Wight, Festival No.6 and Kendall Calling. Build A Tower was recorded close to home at Edwin Street Recording Studios in Bury and produced by Phil Bulleyment (Gaz Coombes, Dutch Uncles). It will be the band’s third album, and their first with Modern Sky, following the release of their eponymous debut (2011) and Cavalcade (2015), both of which were released independently. In summer 2017 the band recorded a six-song set of stripped down songs at Portmeirion Town Hall, accompanied by strings arranged and conducted by Festival No.6 composer-in-residence Joe Duddell (New Order / Elbow / Daughter / James). A limited edition Live At Festival No.6 album, featuring all the songs performed on the night, will be available with certain initial pre-order bundles from the band’s webstore. The band have built up a loyal fanbase from their previous releases and extensive touring, culminating recently with sold out shows including Manchester’s 2000 capacity Albert Hall, as well as The Garage and The Borderline in London. Already confirmed for Liverpool Sound City, Stag and Dagger Festival and Kendall Calling, 2018 is shaping up to be the year that catapults the band into the limelight. 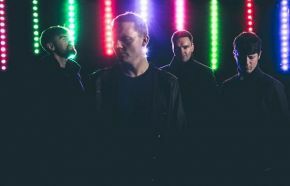 The Slow Readers Club will be completing an extensive UK tour in support of Build A Tower running throughout April and May this year. The band will play a their headline London show at Islington Assembly Hall on May 25th. Full tour dates for The Slow Readers Club can be found below.